Place names tell stories. They endure and evolve over generations, often holding clues to a forgotten past. Hiking around Washington (the state, not the “other” Washington), one encounters many place names that are clearly of indigenous origin, but otherwise have little meaning to casual passersby or even to lifelong local residents. Names such as Willapa (the valley where I grew up), Entiat, Methow, and Palouse become so commonplace, we seldom consider the derivation of these words that are clearly not English. Although we may suspect them to be of indigenous origin, most are not merely remnant Native American words or place names — they are the names of people, the First Peoples who once inhabited the places that bear their names. However, these First Peoples’ existence — both historic and current — is often obscured by their absence from those very places. The arrival of non-indigenous settlers dramatically — catastrophically — altered our First Peoples’ very existence. Within the span of but one or two lifetimes, First Peoples were swept both from land and from memory to make room for newcomers, gone from the homelands they had inhabited for countless generations. In a few unfortunate cases, they no longer even exist, like the Willapa of my childhood home. By “treaties” with non-indigenous settlers from other lands, these First Peoples were systematically and forcibly removed from their homelands and consolidated — often arbitrarily — into the system of tribes and reservations that exists today. Furthermore, those new organizations were often given names unrelated to many — or any — of the First Peoples who comprised them, rendering many First Peoples virtually unknown beyond the borders of reservations and pages of history books, conveniently disconnected from the homelands they once inhabited. For example, not one of the twelve confederated tribes of Washington’s Colville Reservation — the Colville, Chelan, Okanogan, Lakes, San Poil, Nespelem, Entiat, Methow, Moses-Columbia, Wenatchi, Palus, and Chief Joseph Band of the Nez Perce — was initially named “Colville,” a name carelessly applied to the reservation and First Peoples who live upon it by non-indigenous settlers in reference to the reservation’s proximity to Fort Colville, which was in turn named for a slave-owning governor of the Hudson’s Bay Company. Yet, the actual names of several of those tribes are instead more readily recognized as Washington cities, geographic features, and popular vacation destinations. Land acknowledgements can take many forms. Governments, educational institutions, and businesses post acknowledgements of the First Peoples on whose homelands their campuses stand or on which they conduct their affairs. Land acknowledgements are also recited before classes, sporting events, business meetings, weddings, and other gatherings. Those of us who enjoy hiking the Pacific Northwest also have an apt opportunity to recognize the relationship between ourselves, First Peoples, and the natural spaces we all treasure. And, the digital age facilitates acknowledgement of that combined experience. Not only are we able to share our wilderness experiences almost instantaneously in photos, blogs, and other posts across social media, but information about those magnificent places is readily available at our fingertips. Adding a land acknowledgement to our social media posts can be as simple and logical as noting that the trail we hiked lay on the historic homeland of the specific First Peoples of that area. You may have noticed that a few Instagramers in the hiking community have begun to include basic land acknowledgements along with the locations of the photos they post, for example, “Ancestral lands of the Quileute” or “Historic homeland of the Kittitas.” This is why. Proper, respectful land acknowledgement does require a little work. Before slapping the name of a local tribe on your post, make sure it’s accurate. Again, this is where technology empowers. Simply conducting an internet search using a place name and a relevant term such as “Native American” will provide a great start. Although not every website is an authority on indigenous cultures, the internet contains a surprising wealth of information on North America’s First Peoples (and especially those of Washington), including geographic ranges of indigenous homelands, identification of individual bands and their specific locales, and traditional spelling of indigenous names — often even in the alphabet used by the tribe for its first language. Once you have an idea of who the First Peoples of a specific location are, try checking that tribe’s or reservation’s website, which should be considered an authority on information about the tribe. Note that some First Peoples refer to themselves with a name other than that given them by treaty or by common, non-indigenous use. For example, the Twana of Washington’s Olympic Peninsula consider “Skokomish,” the formal treaty name by which they are commonly known, a misnomer; the Wenatchi and Yakama of central Washington spell their names differently from the cities, valleys, and rivers named for them; and the Ts’elxwéyeqw of southern British Columbia and northwestern Washington refer to themselves with the spelling of their first language, rather than the anglicized version, “Chilliwack,” even when otherwise writing in English. Land acknowledgement is a first step toward greater inclusion of our First Peoples and their experience as Washingtonians and Americans. Use it to consider how you can learn from or even partner with First Peoples in your community. Our First Peoples still care for our land and many are at the forefront of efforts to protect and preserve it for all. Washington is truly fortunate to have so many of its First Peoples remaining as integral members of its communities, demonstrating stewardship of the land and leadership in social justice. A final note: delving into the history of non-indigenous relations with First Peoples can make you heartsick. Learn to just “be” with that discomfort. Don’t defend. Don’t deflect. It’s not about guilt or blame, but rather acknowledging the past and working toward a better, more inclusive future. Land acknowledgement is about respect. Respect for one another, respect for our shared experiences, and respect for the land that is home to us all. As hikers, we already have a special appreciation of our great outdoor legacy. We are close to the land. We sense a connection with wild spaces. We understand how they sustain our physical, emotional, and even spiritual wellbeing. And, we understand the concept of sharing them with others. Land acknowledgement is an opportunity to deepen that appreciation for our land, how we’ve come to enjoy it, and how it connects us across time and culture to our broader community. Great news! Thanks to the partnership of individuals, communities, and local organizations, the private property around the Lake Serene Trail has been purchased by Forterra as hoped, saving the forest and habitat around the trail and preserving public access to this Pacific Northwest jewel. Many thanks to all who contributed to this worthy endeavor! 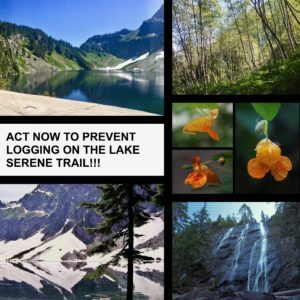 Unbelievably, one of the most loved hiking destinations in Western Washington, Lake Serene and Bridal Veil Falls, is now closed for logging later this year on privately-owned land within the first mile of the trailhead, but there is still time to prevent that tragedy from taking place. In the checkerboard that is local land ownership, the Lake Serene Trail begins in national forest, crosses a privately owned tract, and then reenters national forest for the remainder of its distance. The area to be logged is the privately owned portion. That parcel is not owned by a small landholder in need of income or escape from exorbitant taxes on standing timber — it is owned by Weyerhaeuser, one of the largest private holders of timberland in the United States. In comparison to Weyerhaeuser’s vast portfolio of timber tracts, this small arc of woodland around the Lake Serene Trail is but a pinecone dropped in the forest. While Weyerhaeuser may use its land as it sees fit, the greater public good in preserving this strip of forest outweighs its commercial interests. Over 45,000 hikers use the trail to visit Lake Serene and Bridal Veil Falls each year, which contributes not only to their own well-being, but also to that of the economies of the small communities in the Skykomish Valley below. Needless to say, repeated clear-cut timber harvesting (this will be the third and forth time portions of this forest have been razed) wrecks havoc on the plant and animal species that depend on the forest, especially in riparian habitat such as that along Bridal Veil Creek, which flows through Weyerhaeuser’s parcel. Logging by a privately owned commercial interest will prevent use of the surrounding publicly owned land, needlessly mar the landscape around one of the area’s most popular hiking trails, destroy delicate creekside habitat, and potentially damage local economies that depend on their adjacent wilderness resources. Forterra, a regional organization that partners with local communities to ensure sustainable land conservation and stewardship, has offered to purchase the parcel from Weyerhaeuser and minimize the impact of logging, but must have the funds to do so by October 30, 2017. 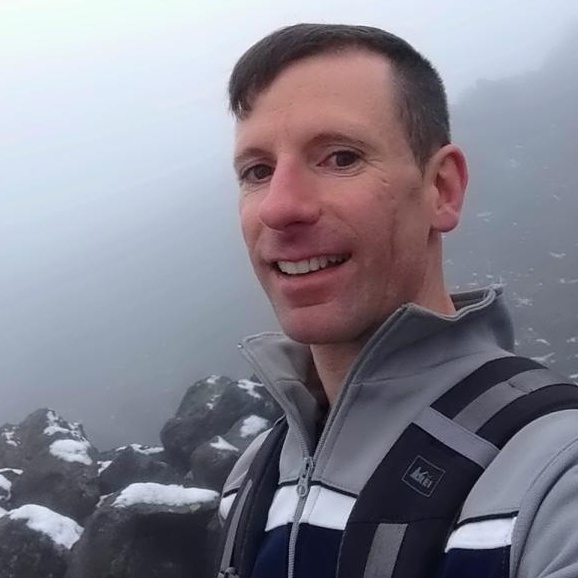 To help reach that goal, a local Seattle couple has pledged to match community donations up to $75,000 toward the purchase price. The rest is up to us! To be clear, if Forterra succeeds in purchasing the land, it will permit logging of a portion of the parcel (less than half) prior to purchase to help offset the acquisition price, but will preserve the forest around the trail and, more importantly, the streamside habitat around Bridal Veil Creek. This is not inconsistent with Forterra‘s goal of forging sustainable solutions to land conservation. Better to save some of the forest — its key, most vital parts — than none at all. Forterra also pledges to ensure that the logged portion is replanted with greater and more natural plant diversity than currently exists after previous harvests. Finally, purchasing the property and ensuring that this popular trail remains unblemished supports Forterra‘s broader goal of creating, bit by bit, a “Great Northern Corridor” of sustainably managed and conserved forests, farms, and communities along the west slopes of the Cascades, including its specific focus on revitalization of the town of Skykomish and its surrounding scenic areas. The opinions expressed in this post are those of the author and do not necessarily reflect those of any other person or entity named herein.